Kevin Sullivan’s involvement in performance art dates back to 1984 when he enacted his first performance on the UCLA campus at a time when performance art was the dominant genre at The UCLA School of Art. Since that time, Sullivan has enacted approximately 30 documented performances, as well as dozens of experiments in art rock and roll, all directed with an eye toward social commentary. His paintings, films, books and critical writings also been widely exhibited and distributed over the last three decades. His projects include: Towards an Ape Theatre (2016-18), old taco bells (2014), This is Bruxism (2000), The Revolutionist (1998), Residuum (1991), and The Diaries of Paul Varnac (1988). 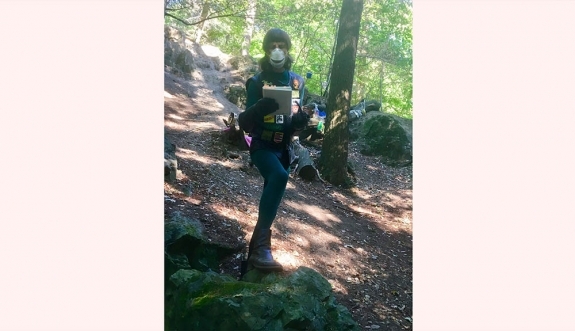 In 2018 Sullivan was a scholar/resident at the 9th International Waldkunstpfad in Darmstadt, Germany where the theme was Art Ecology. Kevin Sullivan will be presenting a lecture titled “ Performance Art, Ecology and Sustainability.” This presentation was developed as part of Sullivan’s participation in The 9th International Waldkunstpfad in Darmstadt, Germany in 2018, where the theme was Art Ecology. Sullivan will be addressing the history of performance art over the last century as it relates to the notion of Art Ecology, while also sharing his own work and theories as to what constitutes a sustainable art practice.